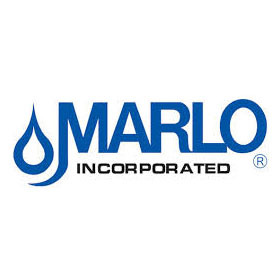 Marlo Incorporated Membrane Clean-In-Place (CIP) Systems – Messplay Machinery Co.
Marlo Clean-in-Place (CIP) Systems are engineered for on-site cleaning of Reverse Osmosis (RO) and other membrane based water treatment equipment. Periodic cleaning of the membrane elements will extend the useful life and greatly improve the economics of ownership. Systems are designed to work with all types of membrane cleaning procedures including inorganic mineral scale (low pH), biological/organic fouling (high pH), and sanitization cycles. 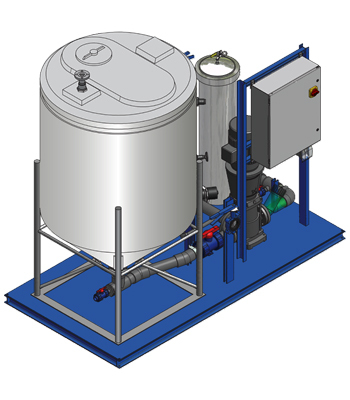 Each system includes a cleaning solution tank, transfer pump, and sediment filter to trap debris from re-entering the membranes during recirculation. All steps of the CIP process are to be performed manually by an equipment operator. The transfer pump and sediment filter housing are mounted, pre-piped, and pre-wired directly on the RO skid. The cleaning solution tank is free-standing and can be stored when not in use. Includes a set of hoses and quick-connect fittings for the feed and return lines to and from the RO skid. All CIP equipment including the cleaning solution tank are factory mounted, pre-piped, and pre-wired on a dedicated skid assembly. The Skid Mounted configuration is a good choice for installations where multiple RO systems are in place or where a hard piped CIP system is desired. This option can also be modified for portability for easy movement to storage or other locations within the plant.